France is an acknowledged leader in many spheres, like top fashion, beauty and style, food and wine. It established many world standards which are respected by many. So, no wonder that computer games developers decided to create a new category of games, which in that way or the other are connected with this wonderful country, like they earlier created Chinese games, German games, Latvian games, etc. If you are interested in fashion and beauty you can play some dress-up games, where you will have to dress up music, sport or cinema celebrities. You have a whole staff of professional designers and makeup masters at your disposal. Do your best to make your celebrity the most beautiful. Use clothes and accessories from the famous Christian Dior, Chanel, Karl Lagerfeld, Roberto Cavalli, Ralph Loren, Dolce&Gabbana, etc. French are also famous for their excellent skills in gambling. 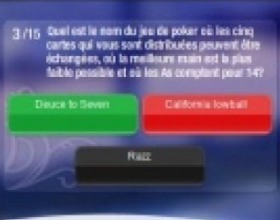 For example, in Poker Quiz poker enthusiasts will be overwhelmed by this France PokerListings' game. You can test your knowledge on this subject while feeling the adrenaline due to prix. Win big or lose everything! The other example of the genre can be Blackjack Trainer. Want to join the world of Parisian grande salle? In that case try an excellent blackjack trainer that allows you to optimize your chances against а bank. Your task is to reach 21 points. You have two cards. You can choose between: "Stay" - keep your hand hoping that the dealer does not have better cards, "Hit" - Take another card. 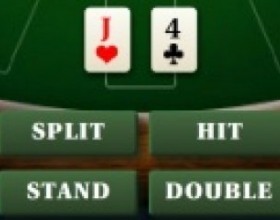 Also you can Split and Double. Values: Figures - 10 points, Point Cards - value worth, Ace - 1 or 11. Like playing something silly and senseless when there is nothing else left to do? Le casse dents from the category of disgusting games will definitely suit you. 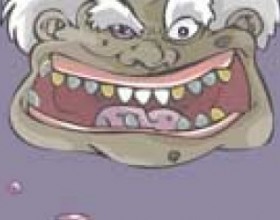 This time you will have to extract all loose, caries and false teeth from the monsters mouths with small purple ball. Get bonuses, extra lives and much more. Use your mouse to control the game. Find out more about French games on our web-page. As a matter of fact this category is on the development stage, so it is worth checking what new games are appearing in order not to miss something really interesting. Good luck and enjoy gaming!